WHERE SERVICE, QUALITY & AFFORDABILITY COMES FIRST! When Nathan Brandon started Always Affordable Plumbing (AAP), he made a commitment to change the reputation of the plumbing industry. Many plumbing issues cause a terrible inconvenience and financial burden to homeowners and businesses. Unfortunately, this is seen as an opportunity by less-than-reputable plumbers to take advantage of the situation. The practices of “up-selling” and “price-gouging” when people are in-need of help is one of the lowest forms of business. This type of behavior does not represent Sacramento plumbers as a whole. However, it happens enough to make people skeptical of the plumbing industry. Always Affordable Plumbing is determined to improve the industry by providing service, quality, and affordability for all of your plumbing needs. Always Affordable Plumbing understands how inconvenient a plumbing issue can be, but also understands that fixing the problem quickly AND correctly can prevent thousands of dollars in other repairs or damage. Indoor plumbing is one of today’s modern conveniences that is often taken for granted. When something goes wrong with our plumbing, it is often an “emergency”. Even if just because of the terrible inconvenience it creates. Always Affordable Plumbing understands the tremendous burden that even small plumbing issues can cause a home or business. AAP also understands that fixing the issue quickly, AND correctly can potentially prevent an even more expensive repair down the road. 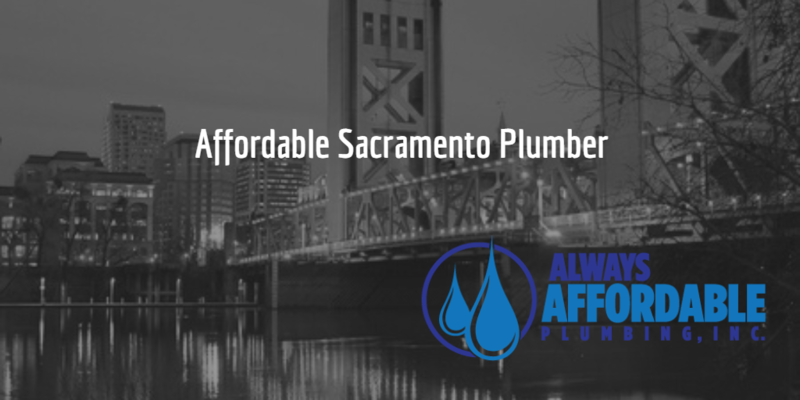 Always Affordable Plumbing offers Sacramento 24-hour emergency plumbing services, as well as FREE home plumbing inspections. Sometimes plumbing issues happen at the most untimely moments. Have you ever had a clogged sewer drain while entertaining over the holidays? Or had a burst pipe in the middle of the night? When your plumbing issues just can’t wait, Always Affordable Plumbing can be there for you, with service and quality at a fair price. A broken water line in your yard can not only cause water damage to your property, but can also increase your water bill. AAP will be able to identify the issue quickly, anytime. Additionally, AAP will give you your repair options and estimated costs. This allows you to make an informed decision that is best for your situation. Don’t ignore that leaking pipe! A leaking pipe could cause a tremendous amount of water damage if left unaddressed, as well as increase your water bill. Day or night, and even holidays, AAP is there for you! Always Affordable Plumbing believes that the best way to keep your plumbing repairs affordable is to prevent major issues. The best way to do that is to take advantage of our FREE home plumbing inspection. This top-to-bottom inspection provides a detailed report on all of your home plumbing equipment. AAP checks drain pipes, toilets, fixtures, sinks, drains, exposed pipes, and more. This service is 100% free, with no obligation to purchase or use AAP for any identified issues. It is our way of proving our commitment to service excellence to the community. If you are thinking of selling your home, or you just purchased a home, AAP’s FREE Home Plumbing Inspection report will provide you with peace of mind for your home plumbing equipment! For example, most home owners don’t know that regular maintenance on their water heater can prolong the life of their heater, and prevent an expensive, untimely replacement. AAP’s home plumbing inspection can let a new homeowner understand the basics of plumbing maintenance. Additionally, AAP will outline and detail any issues and potential issues we find. Tankless water heaters, which are also known as “on-demand” heaters, can save you money and water. AAP certified technicians will help you decide if a tankless heater is a good option for you. For example, while tankless heaters cost up to 3 times more than a traditional heater, they can save you up to 20% on your hot water bill. There are a lot of pro’s and con’s to consider. AAP will walk you through your options, and our technicians can also let you know if there are any energy rebates to help with the cost of installation of a new water heater. Did you know that 80% of Sacramento’s drinking water is supplied by our area rivers? Sacramento provides a lot of water sanitation already. However, a home water filtration system might be right for you and your family. AAP can explain how water filtration works and what some of the benefits are. Consider, for example, that your tap water may be exposed to contaminates after it leaves the sanitation center, before it reaches your home. Additionally, chlorine is often used to sanitize city water, which can be make your water taste bad and can dry out your eyes and skin. CONTACT AAP today to learn more about home water filtration systems. If you need a Sacramento plumber, call AAP. Whether you need Emergency plumbing services, a sewer line replaced, or a leaky faucet fixed, Always Affordable Plumbing is here for you. Service, quality, and affordability for our customers always comes first. Call today to schedule your appointment!